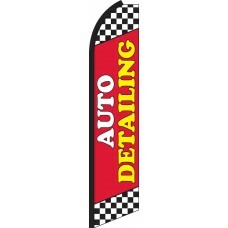 Our Car Wash and Auto Detailing Swooper Feather Flags are extremely colorful and are easy to read. Get the attention from prospective customers as they drive down the road with these striking fluttering flags. If you operate a Car Wash, do your customers know that you also offer premium detailing service? Likewise, if you operate a gas station with a car wash, do your customers know that your car wash even exists? Our bold Feather Flags are a great way to attract new customers and bring in existing customers to new services that they didn't know you offered! Car Washes are often mundane looking locations that do not "jump out" at consumers. Our colorful Swooper Flags are a great way to make sure potential customers notice your car wash. How many customers drive by your location every day and do not even realize you exist? These potential customers may need their car washed! make sure they know that you exist and that you want their business! At just $69.95 for a complete feather flag set, how many car washes or detailing services do you need to sell to make a profit from these flags? 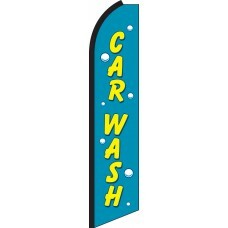 Our feather flags are the most economical and effective way to advertise a car wash!